Figure 1: Distribution of the computed electron effective masses and band gap energies for ternary and quaternary AlxGayInzO3 materials. Transparent conductors are an important class of materials that are electrically conductive with low absorption over the visible range of the electromagnetic spectrum. A combination of both of these characteristics, which are typically competing properties, is crucial for the operation of a variety of technological devices such as photovoltaic cells, light-emitting diodes for flat-panel displays, transistors, sensors, touch screens, and lasers. However, currently only a small number of compounds are known to display both transparency and conductivity suitable enough to be used as transparent conducting materials. 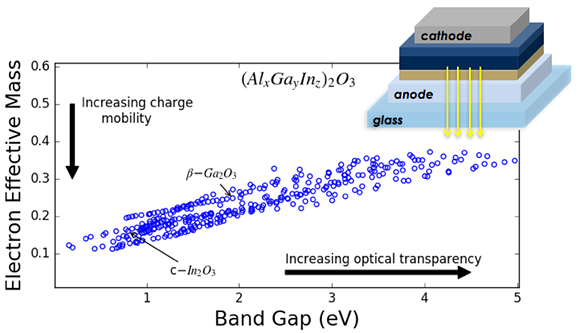 Group-III (aluminum, gallium, indium) sesquioxides are some of the most promising transparent conductors because of a combination of both large band gap energies, which leads to optical transparency over the visible range, and high conductivities. In addition, they are chemically and thermally stable materials, and relatively inexpensive to produce. Alloying these compounds in ternary or quaternary mixtures (with the stoichiometric formula of AlxGayInzO3, where x+y+z=2) could allow for the tuning of these key properties over large ranges. Several AlxGayInzO3 materials with various values of x, y, and z have been screened computationally through an analysis of the bandgap energies (for transparency) and effective masses (for charge-carrier mobility). We use a combination of DFT-based cluster-expansion models combined with fast stochastic-optimization techniques to efficiently search (meta)stable configurations for many lattice types. Through this work, several new stable and (meta)stable alloys have been identified phases with smaller effective mass than hallmark materials, while still maintaining a large bandgap indicating that an increased performance as a TCO material could be expected.